Nás na Riogh Housing Association (NNRHA) is a voluntary, not-for-profit group with charitable status, affiliated to the Irish Council for Social Housing. Since 2000 NNHRA have been working to provide independent housing for older persons, and to provide on-site inter-generational facilities, at the former Convent of Mercy building and the old Parish Centre in Naas. 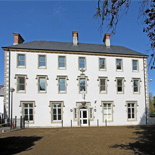 The housing scheme which comprises of 53 apartments, is located in the heart of Naas, beside the Parish Church in the grounds and building of the old Mercy Convent. McAuley Place is creating incredible opportunities to volunteer locally and in this way is enabling active citizenship. J.F.Dunne Insurances are proud to be associated with McAuley Place and sponsor a coffee morning every Thursday where people can come and discuss their health insurance and general insurance requirements.